Previous to Bill Graham’s first concerts at the Fillmore Auditorium, Graham was involved in the San Francisco scene by producing the San Francisco Mime Troupe. 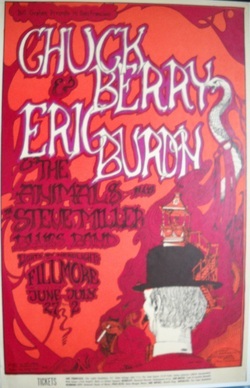 From 1966 to 1971, Graham produced concerts at the Fillmore, and this concert poster series of 287 posters was produced as ‘Bill Graham Presents”. These posters, though well numbered, can be difficult to differentiate between first and later printings of the same poster, but again Eric Kings collector’s guide comes to the rescue. At first only a small quantity of each poster was originally produced, often in two runs before the concert. Numbers were as small as 500 original posters for the first posters, but soon grew, after BG-9, to 1000 posters. By BG-30, 3500 posters were being printed before the concert. Handbills were printed until BG-49, with the first original postcards introduced as BG-44. Earlier numbers were reproduced at later date and were not printed at the time the original poster was printed. Again, Eric King’s guide sorts this all out, again making a meaningful collection possible.